At the April meeting of the California Water Commission, Trevor Joseph and Steven Springhorn with the Department of Water Resources Sustainable Groundwater Management program gave a high-level overview of how groundwater sustainability agency formation is going so far, along with a preview of new data tools that the Department is working on to provide information to the groundwater sustainability agencies as they are developing their groundwater sustainability plans. 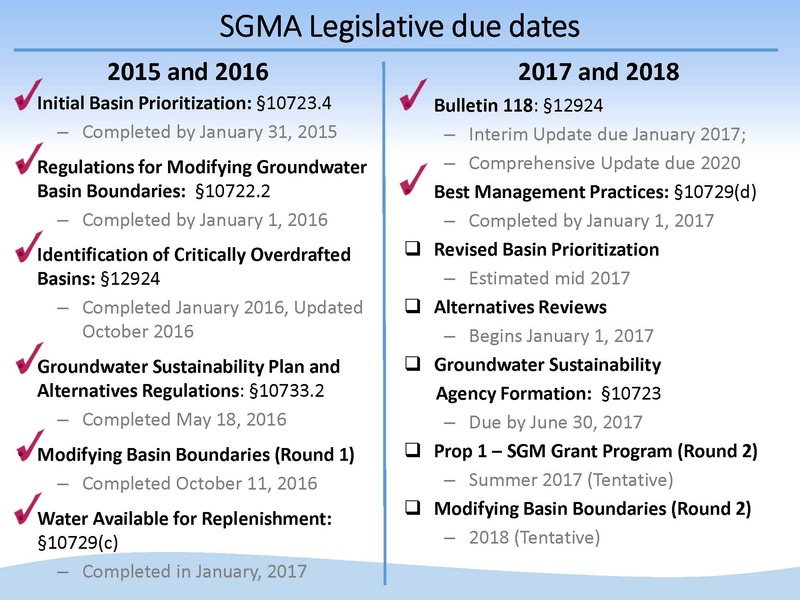 Trevor Joseph began with an update on the status of the Department’s important projects and activities related to implementation of the Sustainable Groundwater Management Act. Since the Sustainable Groundwater Management Act passed in September 2014, many activities related to implementation have been completed. Mr. Joseph noted that there has already been one round of basin boundary modifications, which was completed in 2016. Another round is anticipated in early 2018; the Department is required to provide a summary and overview of those draft basin boundary change recommendations and receive feedback from the public and the Commission before the modifications are approved. 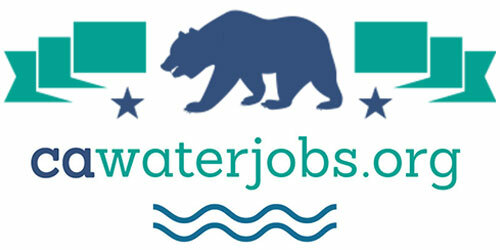 The Sustainable Groundwater Management Act requires local agencies who want to be the Groundwater Sustainability Agency (GSA) for their groundwater basin submit notification to the Department in order to potentially avoid State Water Resources Control Board intervention; it is also a signal to the state that these local agencies intend to prepare groundwater sustainability plans (GSPs). Mr. Joseph then presented a map showing the 127 high and medium priority basins, noting that GSA formation is a dynamic and ongoing activity, and it’s hard to report specific numbers because they are constantly changing. The basins shown in blue indicate those for which the Department has received GSA formation notifications. 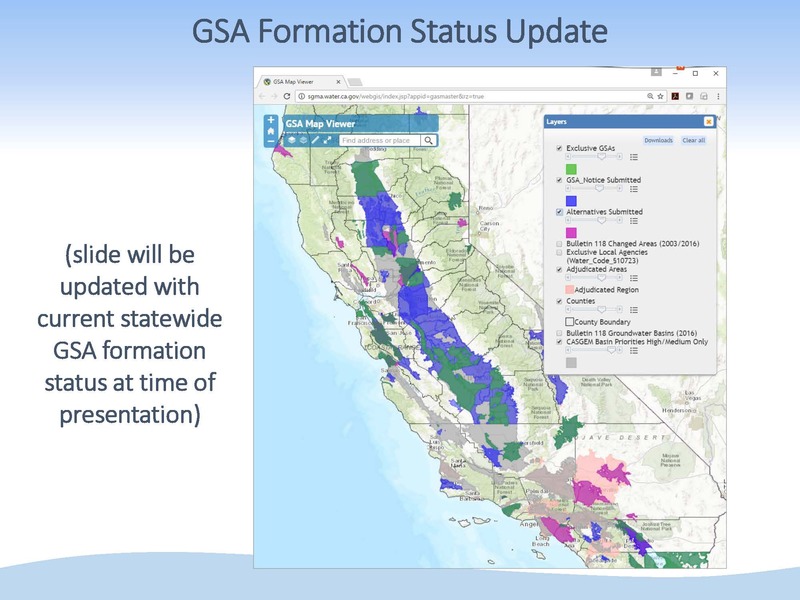 Those shown in purple are where two or more different GSAs or local agencies have submitted notifications for the same area; overlaps do need to be resolved by July 1, 2017 in order for that local agency or group of agencies to continue to be the GSA for the purposes of pulling together groundwater sustainability plans. Besides forming a groundwater sustainability agency, local agencies also have the opportunity to submit an alternative to the Department; those basins are shown in the darker pink. Adjudicated areas, shown in light pink, are exempt from most aspects of SGMA; they have a reporting requirement and had to submit some initial information to the Department. Those, in some cases, cover portions or all of high and medium priority basins. So again, that’s more coverage, kind of like the alternatives. Alternatives were an opportunity for a local agency to submit some information to the Department in lieu of preparing a groundwater sustainability plan. There were three types of alternatives: an existing groundwater management plan or a law authorizing groundwater management, an adjudication, or an analysis that a basin or subbasin has been operated to a sustainable yield for a period of ten years. The basins submitting an alternative groundwater management plan or analysis of operation to a sustainable yield were required to submit those by January 1, 2017; those basins are shown in blue. The nature of the public comments range from support to disapproval of specific alternatives; many of the public comments focused on surface-groundwater interaction. The alternatives and the public comments received are available on the website. There were a number of questions about how the Department will be evaluating the alternatives; Mr. Joseph said it’s no different than the evaluation process for the Groundwater Sustainability Plans. Steven Springhorn, Senior Engineering Geologist with the Department’s Sustainable Groundwater Management Program, then updated the Commission on the work that the Department has been doing to provide technical assistance to the newly forming GSAs and their efforts to develop groundwater sustainability plans. Mr. Springhorn’s presentation was focused more on statewide tools, analysis, and data sets, but there are other additional areas that the Department is working on. 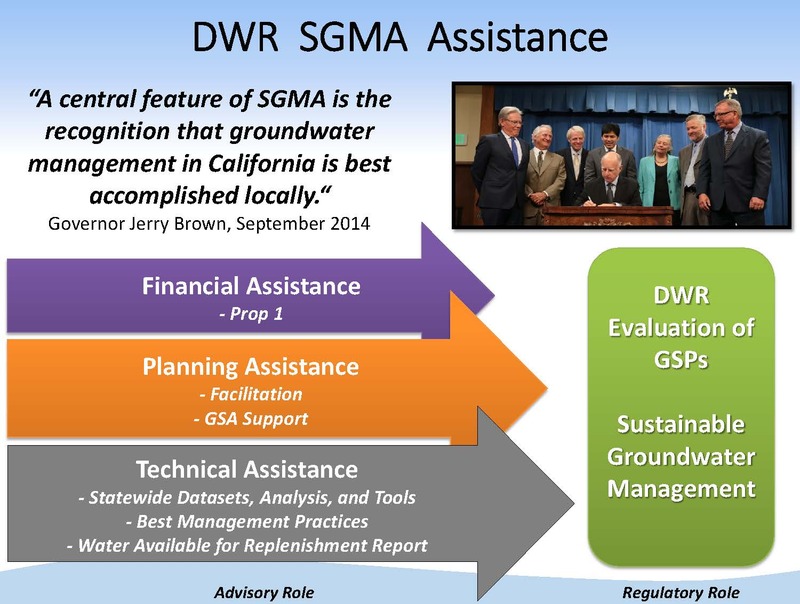 About $1.6 million has been spent on providing facilitation support to around 40 basins across the state; they plan to continue supporting and engaging with GSAs throughout SGMA implementation. 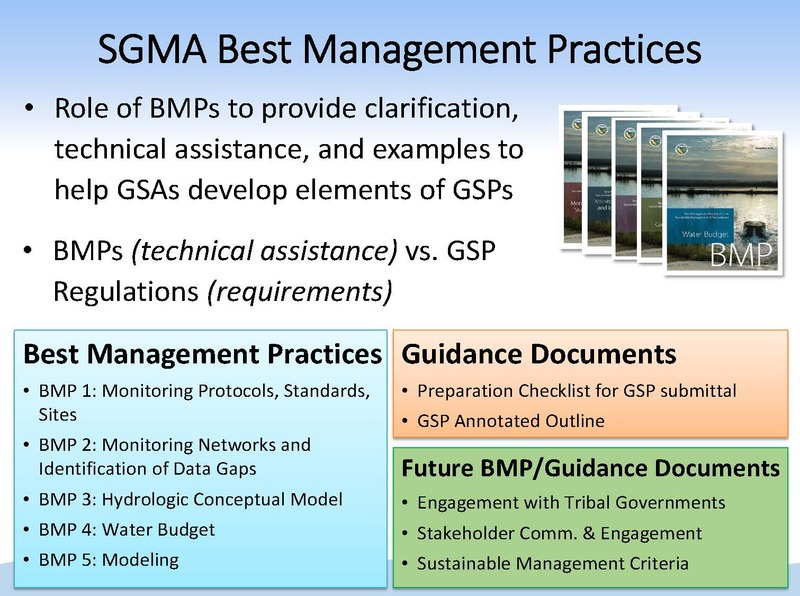 Another key piece is financial assistance, as in the early years of SGMA implementation, GSAs will need funding to get things going while their funding streams are developing. Mr. Springhorn noted that for many decades, the Department has provided technical assistance to local agencies throughout the state, and so their organizational structure is well suited for this. 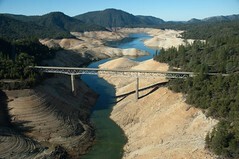 In addition to the staff in Sacramento, there are regional offices throughout the state that have geologists and engineers that are very well versed in the conditions and the variability within the basins in their area. The Department has also established many partnerships with the local agencies throughout the years in other efforts. He then presented the overall framework for the technical assistance program. 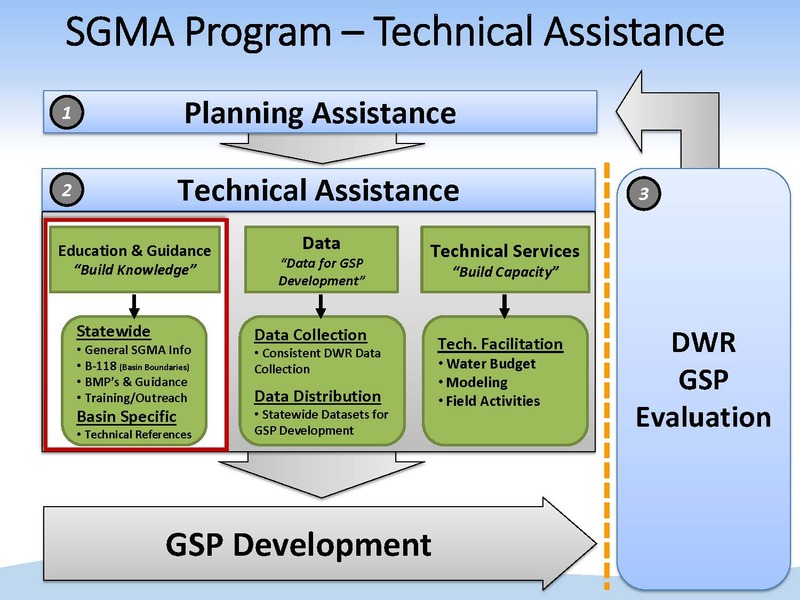 It starts with that planning assistance; once those GSAs are formed and have a governance structure, they will quickly turn to developing their GSP. Education and guidance: Building the knowledge or common understanding of what the SGMA regulations are and the requirements are. This includes documents, such as the Bests Management Practices. Data collection and distribution: Collecting data and making informed decisions. 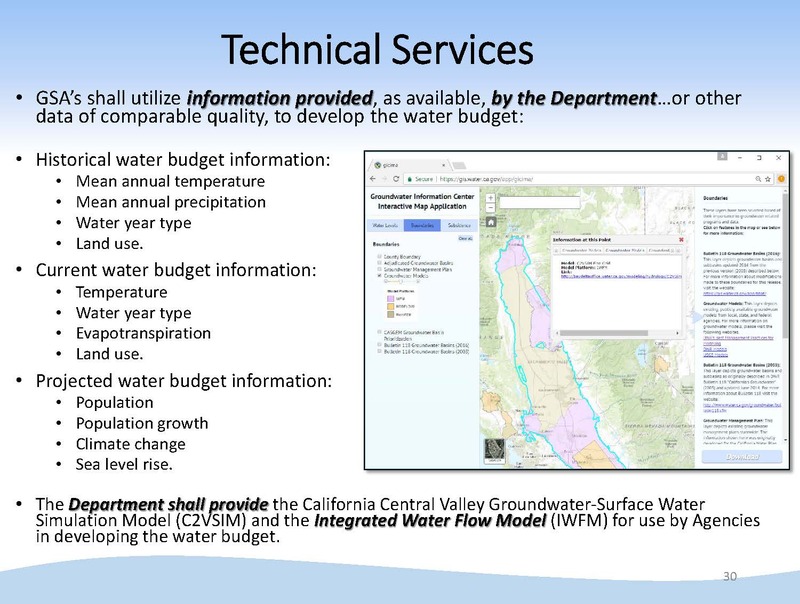 Technical services: Tools and analysis needed to take the information and turn them into components of the plan, such as the water budget. Best Management Practices are now available to provide technical assistance and point to resources for GSAs to help them comply with the regulation requirements. The guidance documents on engagement with tribal governments and stakeholder communications are anticipated to be released in the near future. To that end, the Department is working on developing a clearinghouse of information. 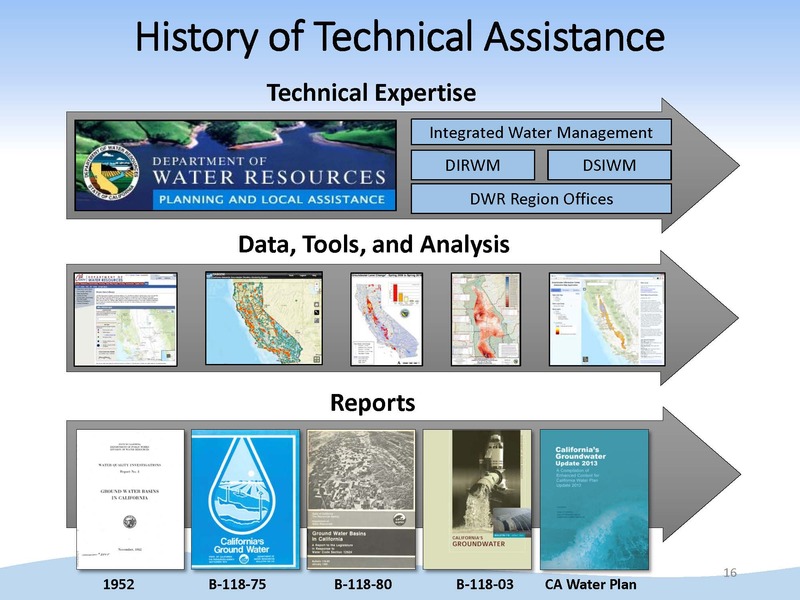 Currently, the Department’s Groundwater Information Center website is focused on mostly groundwater levels now, but they are working to enhance the available information. The platform does allow for users to download data. 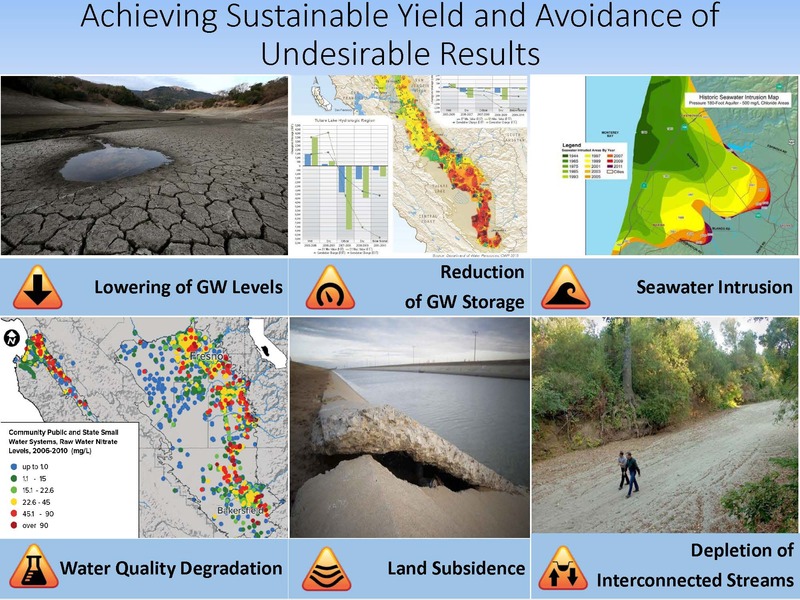 Another key component of SGMA is the performance metrics of the sustainability indicators, so the Department is working to align the platform to the requirements of SGMA. 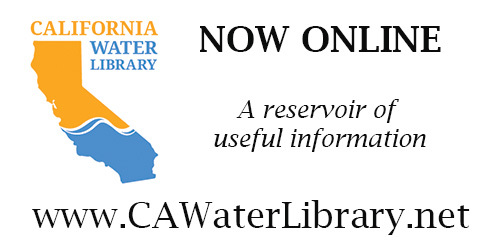 Groundwater levels and change in storage is already available on the website. 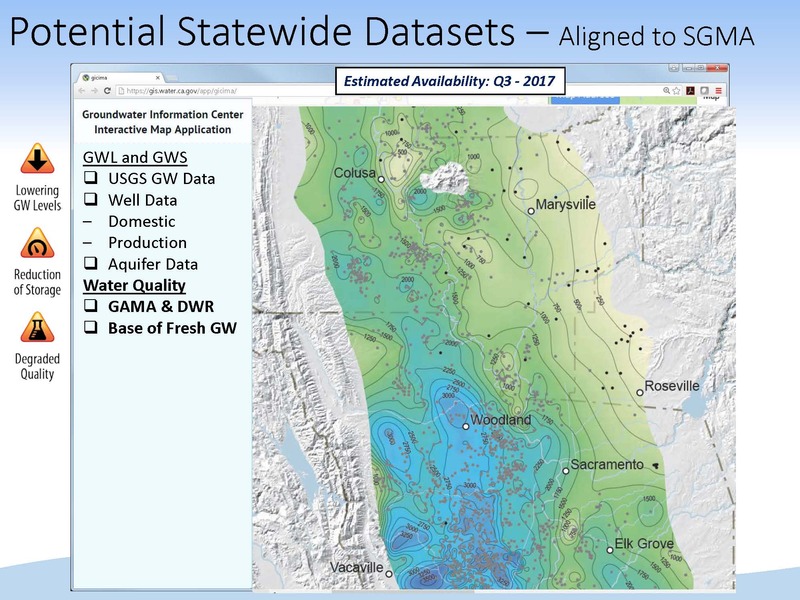 Later this year, the Department plans to release an online tool that allows people to download well completion reports for their basin. “This is a specific GSP requirement, and so the idea is a GSA could take this and put it right into their plan,” Mr. Springhorn said. 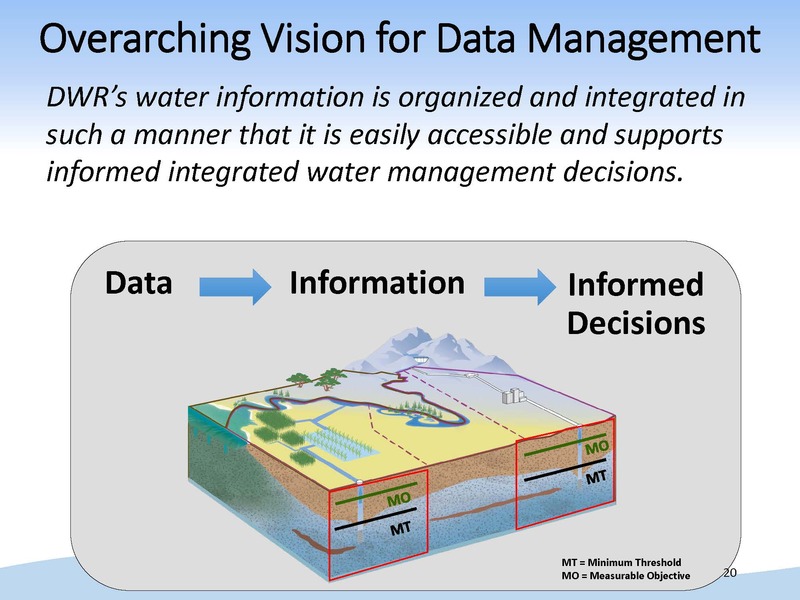 For water quality, the Department has been discussing with the State Water Resources Control Board, which has an existing online system for water quality data, on how to best coordinate to get that information into the hands of the GSAs. The Department is also developing a base of freshwater map for the entire Central Valley; this is expected to be available third quarter 2017. 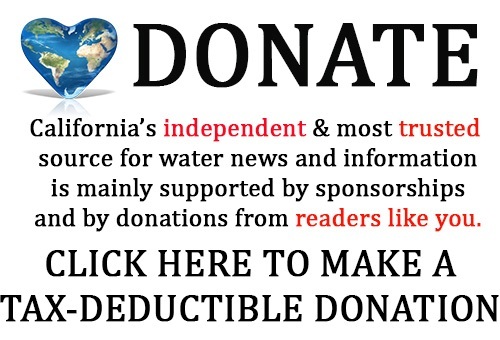 “The online map of the base of fresh groundwater will be an important piece of a GSA defining their basin and the aquifer system within their basin,” Mr. Springhorn said. In terms of subsidence, there are two ways to monitor it: on the ground monitoring stations such as extensometers and continuous GPS sites, or by using remote sense data, such as InSAR or satellite based imagery that shows the change in land surface over time. The Department has partnered with the USGS and NASA to make the data available; it gives GSAs an idea of where and what the current or historical rates of subsidence have been in certain basins throughout the state. There is another effort currently getting underway to resurvey hundreds of GPS monuments in the Sacramento Valley; it is a collaborative effort with counties and surveyors; this information will be a key input for some of these GSAs in the area to use in their GSPs. They have also been coordinating with the Department of Fish and Wildlife and the Nature Conservancy on a map that displays potential groundwater ecosystems. It is another requirement in the GSP to have a map of groundwater-dependent ecosystems in their basin, so the map could be used to fulfill that GSP requirement. Commissioner Orth asked Mr. Springhorn to elaborate on the map of the base of fresh groundwater. Click here for agenda, meeting materials, and webcast.